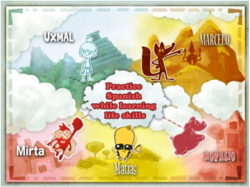 Entertainment content developer Next Stage Productions announced the dual language English/Spanish cross-platform release of Premium Brainy Fables apps as well as the release of improved Lite versions. Brainy Fables is the first series of apps for kids aged 4-7 aimed at developing children’s creative thinking through storytelling, games and karaoke songs. Five (5) Brainy Fables’ characters will guide children through the world of life skills and abilities such as: creative thinking, reaching “to the stars”, believing in yourself, problem solving, overcoming fear, capacity to take action and trying one’s best. By reading, playing, singing, and talking about the challenges of Marcelo, Mirta and all the great Brainy Fables characters, children will have an opportunity to learn and practice English/Spanish language while discovering valuable lessons. Brainy Fables’ adventures have been lived up with music specifically created for each character. Rock, pop, country, salsa fusion or ethnic pop music is the vehicle for children to enjoy and learn in an entertaining atmosphere. Every fable offers charming illustrations, animation and various features that enhance the reading experience – narrated or read myself options, hidden sounds and interactions, a summary of the story’s lesson, coloring pages, the ability for children to write and save their own ending to the story and a page for parents & teachers to help discuss the story’s message for children. Brainy Fables are available in the iTunes Store and in Google Play and include Horacio the piglet, Mirta the super fly, Uxmal and the pyramid challenge, Marcelo the fox and Matias the rebellious chick. It is good to see game developers focusing on critical thinking skills. Anima a Marcelo, Uxmal y sus amigos coloreando sus aventuras. Franco Soldi es el autor de Brainy Fables y padre de dos niños. Trabaja con jóvenes pre-universitarios en ‘Young Potential Development’ desde hace años y ahora Franco escribe para los más pequeños de la casa. Pedro Bascón ha ilustrado Brainy Fables convertiendo cada aventura en una experiencia visual para niños y padres. Pedro trabaja como ilustrador desde hace diez años especializándose en el ámbito de la educación y la infancia. Brainy Fables apps han sido desarrolladas por la productora y distribuidora madrileña Next Stage. For more information on current apps, visit http://www.brainyfables.com. Posted on April 29, 2013, in Uncategorized and tagged Aesop, Children, creative thinking skills., Education, Fables, Games and Learning, Gaming and Education, Google Play, Higher order thinking skills, K through 12, Literature, Uxmal. Bookmark the permalink. Leave a comment.